The understanding of Ulysses, in the opinion of Joyce himself, demands a kind of framework that gives clues to the reader. We have first to fit within the schemes proposed by James Joyce, which was created synthetically, containing controversies or inconsistencies, which will be discussed. However, I recognize that this method that Joyce foresaw is the best way, but has to cover more reality than he did in his scheme (there is so much more than the binding elements he selected). This has to be connected with a way of thinking that allows its use, in our case, rational, objective, "scientific". This discussion for clarification and justification of the framework I propose can be seen by pressing on each item presiding agglutination used. These binding elements of cohesion, connection, focus and unification, are determined using the Linatti scheme and adding others. Take a look at Joyce Project and press Telemachus. You will find there 157 notes about Telemachus. As Prof. Don Gifford tells us, the book I of Homer's Odyssey opens with the invocation of the muse followed by an account of how the council of gods on Olympus, led by Zeus, decides it's time for Odysseus to return home. The scene then changes to Ithaca where we find Telemachus, son of Odysseus, "one boy dreaming with the return of his father," in Fitzgerald's words. The boy is angry and unhappy, threatened with treason and loss of position by suitors surrounding his mother, Penelope, during the absence of his father. These arrogant men are led by Antinous and Eurymachos. Telemachus seeks counsel of the gods and Pallas Athens is revealed to him as his protector. She advises him to travel in search of his father. Stephen Dedalus, his friend Buck Mulligan (medical student), and his English friend from Oxford , Haines, are waking up and getting ready for the day. Stephen complains that he had a restless night because of Haines nightmares. Mulligan, who staged a mockery of the Catholic Mass, criticises him because he refused to pray at the deathbed of his own mother. The three come together taking breakfast and talking. The milk comes from a dairy old woman, with which Haines, with his interest in the native language and Irish nationalism, start a conversation, talking to her in Gaelic. Leaving the tower so Mulligan could go for his morning swim, Stephen is asked to explain his theory of Hamlet. He refuses and Haines and Stephen discuss literature and politics. They find a friend who comments on a drowning, on a guy named Bannon and a girl, which we will later find it's Milly, daughter of Leopold Bloom. Mulligan turns in the tower key and two pence Stephen, who, like usurped Telemachus, moves away aimlessly. It is everything which is there or the effect that is produced in our mind after sufficient development of thought that follows below, under the title "where to find all that in the original text of Ulysses"
Where to find all that in the original text of Ulysses"
Timetable, Scene, Organ, Art, Colors, Shape, Technic will be combined in a specific comment, but can be part of items 1-5. Antinous is a name that means "without common sense" which Don Gifford relates to "antimind" and perhaps it might be worth to find out if Homer wanted to relate to the god Antinous, with connotations that I leave to the imagination of readers. There are several Eurymachos, which can also be seen in, but to our interests, is the child Pybus, who went down in history as Penelope suitor. Don Gifford does not say it clearly, but it is interesting to note that Eurymachos, Antinous and the applicants disrespected the gods when they dispensed Telemacus, which was favored by Athena and Halitherses, which are spokespersons of the will of the gods. When they disregarded this will of the gods they put themselves in opposition to the divine law and therefore they will be punished. Don Gifford intorms details about this attitude of applicants (pg 12). Athena helps Telemachus to get the vessel and the crew for their trip to the mainland. There is a difference between the schema that Joyce gave Gilbert Stuart and the one he gave Linatti, and it is worth mentioning that it relates Stephen with Hamlet, which makes by implication his uncle Claudio Antinous Buck Mulligan and the milkwoman the mentor. 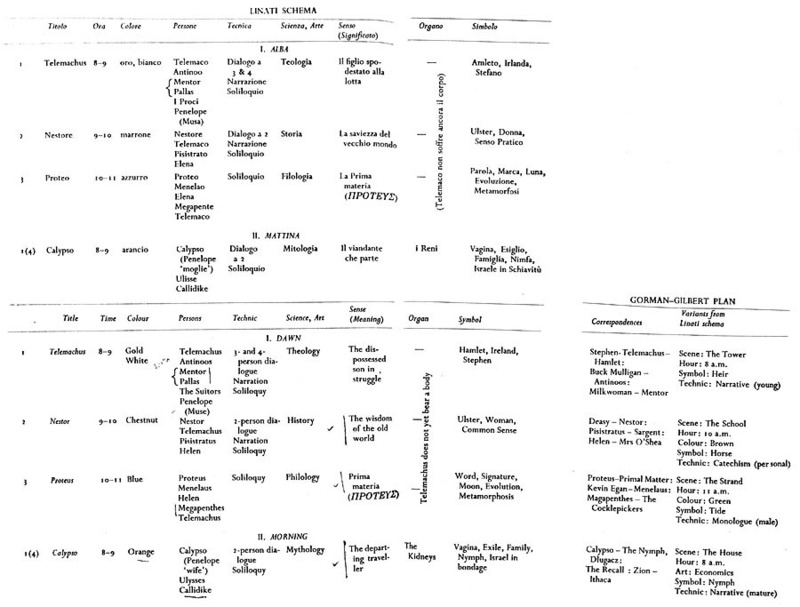 In the scheme given to Linatti, Hamlet is Ireland and Stephen and at the cross reference characters, without indicating correspondence, it appears as Mentor, connected by brackets with Pallas Athena, the suitors and Penelope (Muse). It's interesting because only in Columbia scheme appears the brackets indicated by Gifford, and generally it does not appear in other reproductions, including the one I used. This course of Columbia was selected as an example. start from where you will  sing for our time too. The adventure with the Cattle of the Sun is near the end of Odysseus suffering abroad, yet it is one of the first things Homer tells us. It is a narrative technique called in medias res, which means to begin in the middle of things. As a result, the majority of Odysseus most famous adventures are told in a flashback sequence that spans four lengthy chapters. We also bounce between what it happening with Odysseus abroad and what is occurring with his wife Penelope and son Telemachus back in Ithaca. Additionally, there are a few abrupt transitions to the gods conversing on Olympus. If you feel lost at any point while you read, SparkNotes has an excellent breakdown of the book that you can view for free on their website. 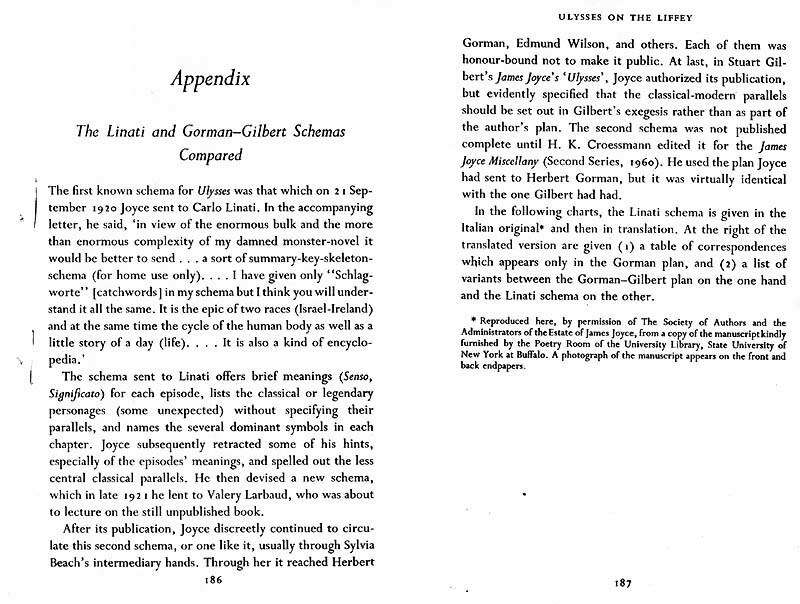 Prof. Don Gifford informs us that the book I of Homer's Odyssey opens with the invocation of the muse (above, with explanation that Gifford does not provide and which is timely, specially for the symmetry we want) followed by an account of how the council of gods on Olympus, chaired by Zeus, decides it's time for Odysseus to return home. The scene then changes to Ithaca where we find Telemachus, son of Odysseus, "one boy dreaming with the return of his father," in Fitzgerald's words. The boy is angry and unhappy, threatened with treason and loss of position by suitors surrounding his mother, Penelope, during the absence of his father. These arrogant men are led by Antinous and Eurymachos. Telemachus seeks counsel of the gods and Pallas Athens is revealed to him as his protector. She advises him to travel in search of his father. The episode opens with Buck mocking the actions of a priest at mass, an affront to the previously devout Dedalus, and an image that highlights Bucks disrespectful and boisterous nature. Buck calls Stephen a fearful Jesuit and pokes fun at the Greek origin of his last name, calling it absurd. Buck nicknames Stephen Kinch, meaning knife-blade, which opposes Bucks own stately, plump and ungirdled appearance. Bucks loud and theatrical gestures as he mimics the priest contrast with Stephens slow, weary, and quiet ones. Bucks light appearancehe is wearing a yellow robe, is covered in white shaving cream, has white teeth glistening here and there with gold points, and has light untonsured hair, grained and hued like pale oak underscores Stephens dark, somber appearance. Buck mocks Stephen for wearing second-hand clothing, for continuing to wear only black as he mourns his mothers death, and for his infrequent bathing patterns. The physical contrasts between the two further highlight the alienation and sobriety that define Stephen. After Buck concludes his performance of the mass, Stephen asks how much longer the Englishman Haines will be staying with them in the tower. The presence of Haines immediately brings forward the tension between English and Irish identitieswherever Stephen goes he cannot escape the haunting force of the Englishman. Buck backhandedly criticizes Stephen by telling him that Haines thinks that he is not a gentleman. Stephen worries about the violent nature of Haines, who screamed about a black panther in the middle of the previous night. You saved men from drowning. Im not a hero, however, if he stays on here I am off, Stephen tells Buck. Haines poses an even greater threat to Stephen, the artist, than to Buck, the strong and heroic doctor. Buck, Haines, and Dedalus exit the castle and walk along the water. Buck continues his theatrical gestures as he taunts Stephen and chants a song, the ballad of joking Jesus, before he walks ahead. Stephen and Haines are left to one another and engage in a calm conversation. Stephen accepts a cigarette from Haines, a friendly, accepting gesture, even though the cigarette case, silver with an emerald is a symbol of the small gem that Ireland is to the dominant England, as pointed out by Blamires (p.7). Stephen realizes that the the cold gaze which had measured him was not all unkind and he discusses the servitude he feels to his English and Italian masters and eventually to the imperial British state and the holy Roman catholic and apostolic church. Haines is understanding of Stephen and concludes, it seems history is to blame. Hainess statement cements the English dominance Stephen experiences and separates Haines, though he is an Englishman, from the damage that has been done. Haines and Dedalus catch up to Buck who undresses and gets into the water. Haines says he will wait to go in. Buck demands that Stephen give him the key to the tower. He also demands an extra two-pence from Stephen. Stephen places the key and money on Bucks clothing and begins to walk away. Buck tells Stephen to meet them at The Ship at noon for lunch. Stephen, however, has already decided that he will not sleep in the tower that night. His statement Home also I cannot go, underscores the sense of lostness and aloneness that fills him. Stephen has no true home to return to. Buck has taken away Stephens final scraps of a home life. Buck has seized Stephens physical belongings: his handkerchief, his money, his space in the house through Hainess presence, and finally his key. His disrespectful nature and the abrasive, intrusive way with which he interacts with Stephen forces Stephen to face himself and the actions that haunt him. Through Bucks usurpation, Stephen must leave the tower and face the world outside. Joyce tells us through the scheme he gave Linati: "Son disinherited, stripped of everything, fighting and struggling with effort"